Tracing the Inevitable Axis/Point is an exhibition that uses multiple forms to create vantage points in which land serves as criterion of temporality. 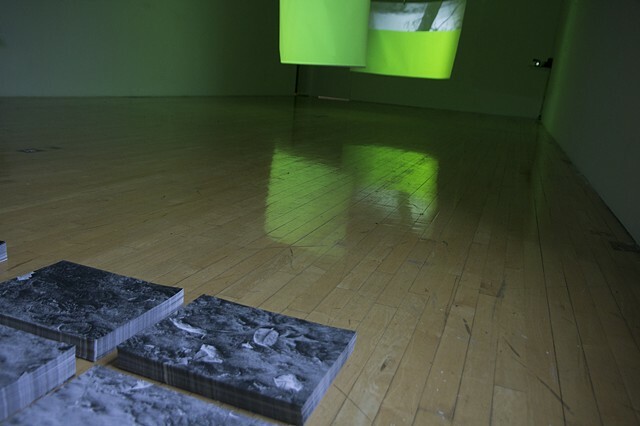 Three interconnected works create a triangulation where language, mapping, and index are presented as subjective visions. These works are derived from the origin of islands, which are either formed by human intervention upon land, or naturally form over the course of centuries. Island Inscribed is a two-channel video projected on parenthetically shaped rear projection screens. The two screens sit askew to the orientation of the room; viewable from either side creating an interior and exterior vantage point. The video presented is of a corporeal experience of land, that of tracing the edge of an island; however, as a viewer in the installation, the island traces you. The moving image either slowly rises or descends to eventually meet the midpoint of the screen but advances no farther. 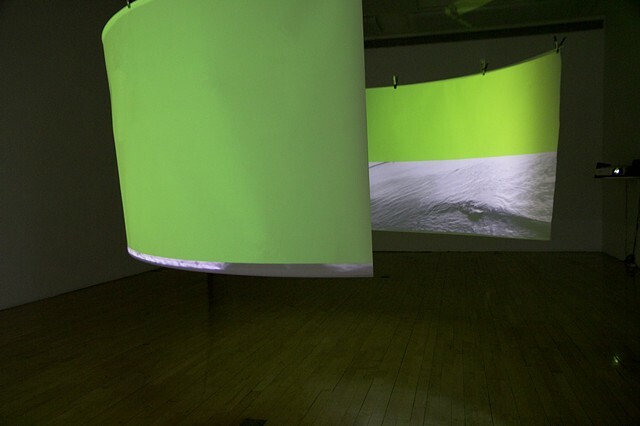 The backdrop is a luminous green, making the apparatus a ‘green screen.’ In cinema the green screen serves as a tool by which a subject can be isolated; the green removed and another location can be imposed as a background. The green screen is the thing which is meant to disappear, but in this case never does. Line by line the circuitous route around the island rises or descends to fill the active void that is the green screen. This conflates disappearance with the idea that one location or setting can be relocated or substituted for another. A multitude of sounds accompany the videos. The rhythmic sounds of pencil on paper syncopate the pacing of the camera across the land and eventually give way to the sound of waves crashing. Upon entering the space, the viewer is confronted with the only window in the gallery, large and located in the northeast corner–an architectural anomaly. 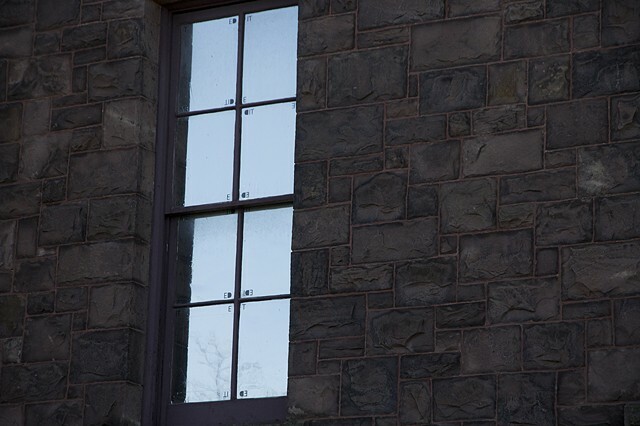 The window’s eight panes are adorned with a film that changes in appearance based on time of day and quality of light. The windows appear at times a mirror, and at other times a variety of colors that are then cast onto the gallery floor. 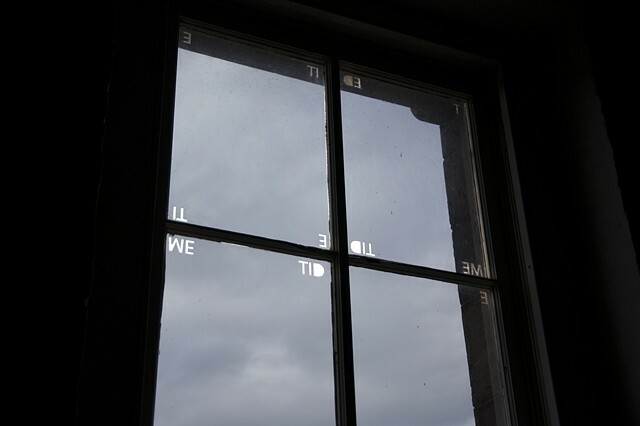 On each pane the film has text cut out, through which you can see the outside, and at certain times of day project light in the shaper of the letters inward, onto the opposing wall. The text is varying combinations of the forward and backward spellings of the words tide and emit. The words never entirely coalesce, yet they suggest completeness when viewed across the window’s central divide. The third part of the installation sits on the floor directly in front of the window. 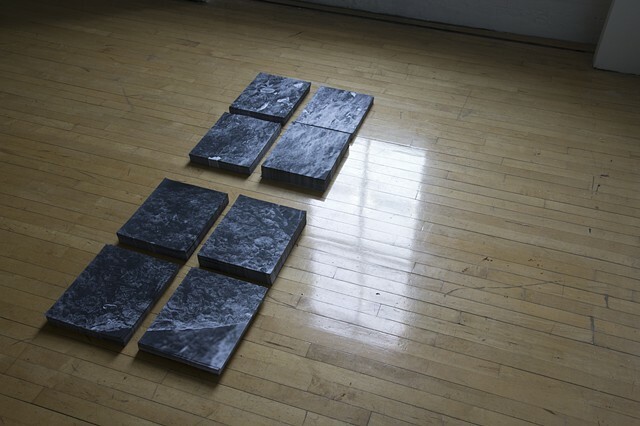 On the gallery floor are eight piles of photocopies, mimicking the eight panes of tinted glass. 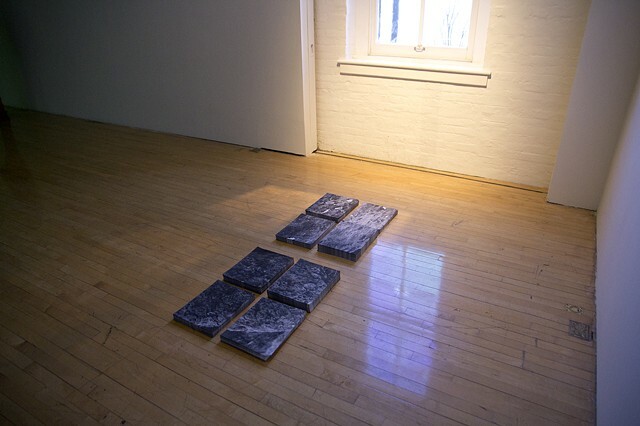 As one moves through the space, the window’s reflection shifts relative to, and in scale with, the piles on the floor activated by the viewer’s synchronous gaze and movement. This relationship conflates the window’s language with the photocopied images of fossilized rocks, correlating the cycles of tides with geological time. 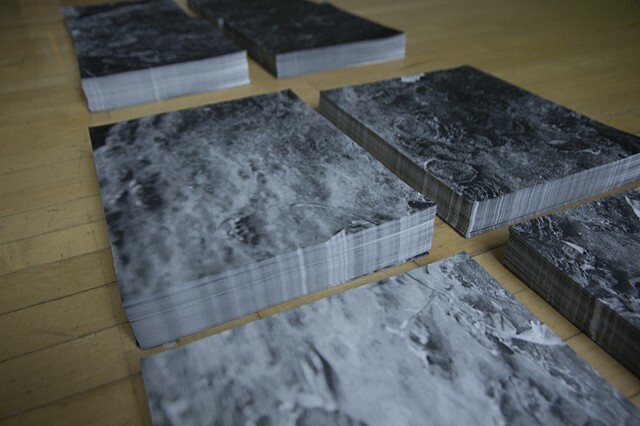 Each copy is printed to bleed, so the edges of the paper contain a visual texture, which gives the printed images of rocks both a solid form and an interior space. Viewers are invited to take from the piles causing a gradual decline in their height, which becomes synonymous with the backlit text on the adjacent window. 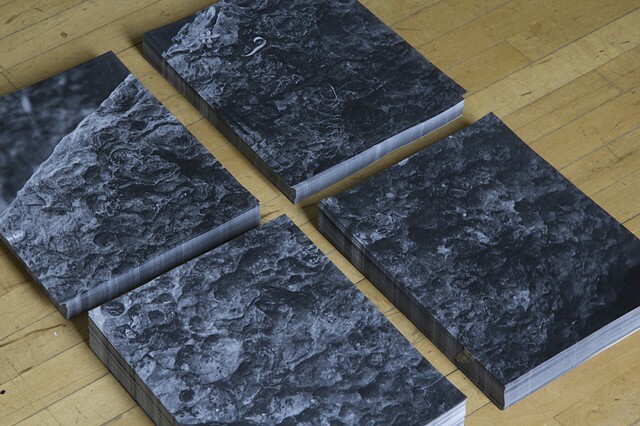 The photographs depict rocks from the same island that has been traversed in the video. On the gallery floor they are autonomous archipelagos, taking on the domestic characteristics of tiles and windows. Each piece in Tracing the Inevitable Axis Point incorporates opposition in natural movements and bridges the two adjacent works. This requires the viewer to confront the work as an active participant while remaining subject to the affect of motion, light, and spatial orientation.